*my reviews/recaps will not have any spoilers as they relate to future events but will have many explanations or clarifications of events currently happening on the screen so if you want to figure it out for yourself, read with caution. **due to several recommendations, i will be discussing some spoilery stuff at the tail end of the review so please pay careful attention. last week i wrote that "finally things have really started to move" and that couldn't have been any truer in episode 4. this was most certainly the most plot moving forward episode in 2+ seasons of GOT... so much so that the death of lord commander mormont was not even one of the last couple of scenes of the episode. so much so that the early great scenes between lord varys and tyrion, varys and lady olenna, cersei and tywin were all a distant memory by the time dany burned the people of astapor to a crisp. bran dreams of a raven and grows frustrated with his newfound skills. catelyn loves to nag even in bran's dreams. arya is hanging with the brotherhood without banners and reminds the hound of killing the butcher's boy in season 1.
sansa hangs out with margaery and is offered to her brother loras. too bad he's part of the kingsguard...oh and gay. varys however learns that littlefinger is planning on taking sansa to the eyrie when he leaves to become the new lord there. no jon this week or the wildlings. king joffrey continues to be charmed by margaery tyrell and awkwardly waves to the crowd. tyrion learns a lot from varys but not why his sister tried to have him killed in the battle of blackwater bay. sir jamie lannister, the kingslayer, drinks horse urine. he attempts to fight with his left hand. he becomes a little depressed and starts to question his self-worth. brienne gives him a pep talk and calls him a woman. lady olenna is great. nonexistent meets decrepit...i couldn't get that out of my mind for a day and a half. she's also quite the schemer just like her granddaughter margaery. they certainly are not willing to stand pat in service of the lannisters it seems. getting sansa stark into the family fold might prove quite useful. theon circles back to the place he just escaped thanks to the guy who helped him escape. i get it, but do you? doubtful. i think it'll be worth it once it's all explained but hard for me to say for sure. his storyline in the show is much more detailed than in the books since he doesn't even have a storyline in book 3. i've read many reviews that don't find his storyline very interesting, but as i've said before, i am actually more invested in his storyline that i am any others in show. perhaps that's because i know what eventually becomes of him. dany speaks valyrian? who knew? one could guess since her people are originally from old valyria but it was a nice twist in the show and well executed. dany knows from her experience in qarth that her dragons are not found of chains and leases. 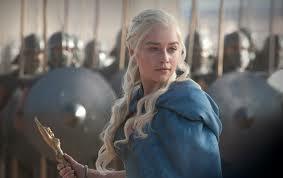 her cunning and moralistic hatred of slavery have resulted in an army of 8k freed unsullied.... and three growing dragons...and two westerosi knights. you could say that the lord commander's death came out of left field but then you weren't paying close enough attention. he fell victim to moral compromise, which dany has shown unwilling to do.. in this case, compromising the values the night's watch were supposed to hold dear... the values that jon and sam kept harping about. lord mormont's reluctant acceptance of craster and his "ways" only led to discord and resentment among his men, especially considering that the lot of them are rapists and murderers to begin with. it was an unceremonious end to his life, but a great turning point in the story of the night's watch especially with the wildlings fast approaching the wall. we finally meet the leader of the merry gang of vigilantes... beric dondarrion who was re-cast since season 1 although you probably wouldn't remember him otherwise since he only appeared for about 3 seconds. as he states in this past episode, he was ordered by ned stark (whilst sitting on the iron throne when king robert was away hunting) to capture the mountain for pillaging the countryside. ned stark ordered tywin lannister to answer for his bannerman's crimes and stripped the mountain of all lands and titles. so since then, beric has been pursuing the mountain (who was pursuing him while at harrenhall) with the help of thoros of myr, a warrior priest, who also prays to the lord of light, just like melisandre. got it? varys deserves a special nod here as well as littlefinger in coming episodes i'm sure. varys teaches us all that he is not to be underestimated after displaying extreme patience in exacting revenge against the sorcerer that took his root and stem. i'd like everyone to remember that in season 1, it was he and magister illyrio (who took care of dany and her brother across the narrow sea and arranged her marriage to khal drogo) who were conferring in the dragon vaults about the impending war (which was overheard by arya). varys' motivations are not well known but suffice it to say that he certainly is motivated. his conversation with littlefinger's right hand woman and lady olenna demonstrate his eagerness to limit littlefinger's power and influence. is it just to save the realm? he did tell ned stark in his jail cell that he only wishes to serve the realm so perhaps his motivation is pure. perhaps he just hates magic as much as he says. what does that mean with respect to dany and her dragons? why did he have a secret meeting with magister illyrio who was helping the targaryens? all good questions. we are moving the chess pieces ever so slightly. dany's power grows across the narrow sea. the realm's protectors in the night's watch have fallen under hard times just as the wildlings and white walkers are growing in strength. all the while, the families in westeros are all vying for power and influence. even varys and littlefinger take their positions as power brokers behind the scenes. i like how the writers are focusing each episode on about half the cast instead of trying to squeeze in a storyline for every character. as we get introduced to more and more characters (which we certainly will) it will become impossible to keep up with all the characters on a week-to-week basis. the one character i hope they return to next week and for a few scenes at least, is davos who finds himself imprisoned on dragonstone. i'm excited to guide us through season 3 of game of thrones so would appreciate any comments or feedback to help structure these posts as we move forward. you can write to me at nohyperboleallowed@gmail.com, or via twitter @hyperboleNOT, or on our wall on facebook at facebook.com/nohyperboleallowed, or just write something in the comments section below. - like tyrion and sansa... when is that happening or are they skipping that? the going ons in king's landing should be fun with a lot of twists and turns between littlefinger, varys, sansa, tyrion, the lannisters and tyrells. - i'm a bit confused as to who roose bolton is pretending to be right now...do his men not know that he's roose bolton or do they think he's reek? i know i'm sort of jumping ahead a bit but obviously they have to let us in on the secret soon or viewers are going to be way too confused to even care anymore. - i mentioned tywin's proficient letter writing campaign above and people seem to think that he's taking steps to ensure that the red wedding happens without a hitch.